Named as the top seeded player for the Men’s Singles tournament in Kitakyushu, Germany’s Timo Boll experienced a relatively straightforward opening day at the Seamaster 2018 ITTF World Tour Lion Japan Open in Kitakyushu but for compatriot Benedikt Duda the journey ended on Friday 8th June. Catch up on the day’s action with our review. Coming through the day without dropping a game, Timo Boll breezed past opponents Yuta Tanaka (13-11, 12-10, 11-5, 11-7) and Mattias Karlsson (11-7, 11-6, 11-8, 11-5) to move into the quarter-finals. However, he won’t be joined by Benedikt Duda, who wasn’t able to build upon his opening round victory over Kristian Karlsson (12-10, 8-11, 11-5, 11-7, 10-12, 11-7) as he exited to home favourite Kenta Matsudaira (11-8, 7-11, 11-9, 14-12, 11-6). Beginning his campaign against Ho Kwan Kit (11-6, 11-7, 7-11, 11-6, 11-8), Jin Ueda went on to beat fellow Japanese star Kazuhiro Yoshimura (8-11, 11-9, 7-11, 11-8, 5-11, 11-6, 11-6) who, earlier in the day, was responsible for No.5 seed Koki Niwa’s exit. Chinese Taipei’s Chuang Chih-Yuan has also reserved his spot in the quarter-finals thanks to a strong outing against Simon Gauzy (11-4, 9-11, 7-11, 11-6, 11-5, 11-6). For the first time in over a year Zhang Jike has returned to winning ways in the main draw of an ITTF World Tour Men’s Singles event after he successfully accounted for No.11 seed Jonathan Groth (7-11, 12-10, 11-6, 11-7, 11-8) and there was a shock exit for Wong Chun Ting with the unseeded Liang Jingkun storming to a six games win (8-11, 11-13, 11-8, 11-7, 14-12, 11-3) against the third seeded player. Liu Shiwen is safely through to the last eight of the Women’s Singles draw after she came out on top in her opening fixtures against Britt Eerland (11-4, 11-5, 11-2, 11-4) and Chen Szu-Yu (11-4, 7-11, 11-7, 11-3, 11-7). Next up for the No.8 seed from China is a meeting with the host nation’s Miu Hirano: victorious over Fu Yu (11-7, 10-12, 11-7, 11-9, 11-7) and Minami Ando (11-9, 9-11, 11-8, 11-8, 11-7), fourth seed Hirano looks in positive form ahead of the big encounter. Two further names booked their places in the quarter-finals: Chen Xingtong overcame successive opponents from Japan, defeating Miyu Nagasaki (11-6, 11-4, 12-10, 9-11, 11-7) and Miyu Kato (11-2, 11-7, 6-11, 11-6, 11-8). Fifth seed Cheng I-Ching sealed her spot in the last eight with a second round win against Hitomi Sato (11-7, 6-11, 12-10, 11-5, 11-8). Earlier in the day, there were shock exits for the seventh and ninth seeded players Feng Tianwei and Doo Hoi Kem who suffered opening round eliminations as the hands of Mu Zi (8-11, 9-11, 13-11, 11-3, 11-4, 11-7) and Bernadette Szocs (10-12, 6-11, 11-6, 11-4, 12-10, 11-6) while 2017 ITTF World Tour Grand Finals semi-finalist Gu Yuting also departed at the first hurdle. 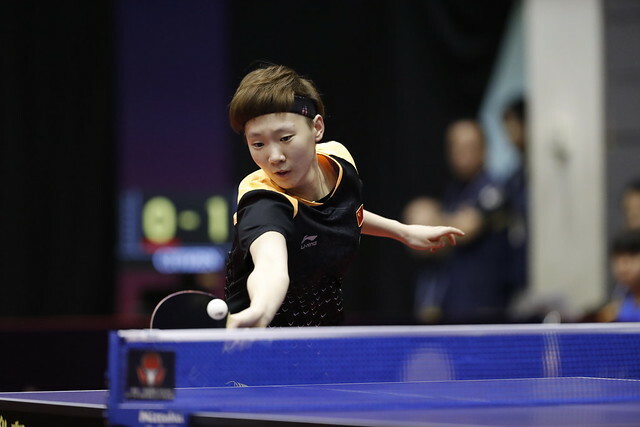 Making its ITTF World Tour debut last week in Shenzhen, the Mixed Doubles competition returned in Kitakyushu. Second seeds Wong Chun Ting and Doo Hoi Kem of Hong Kong exited at the quarter-finals stage of the event following a five games defeat to China’s Liang Jingkun and Chen Xingtong (11-6, 10-12, 11-9, 8-11, 11-9). The No.3 seeds, Chen Chien-An and Cheng I-Ching fell to Korea Republic’s Lee Sangsu and Choi Hyojoo (11-9, 11-3, 7-11, 11-8).